I previously did a post on the second-floor porch of the Cross House. It’s a really interesting post, and you might want to detour and read it. 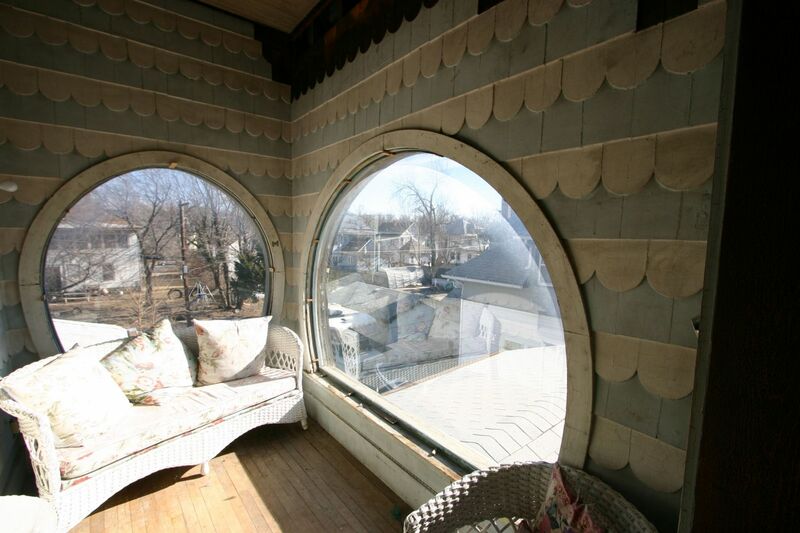 At some point the porch was enclosed, but the previous owner of the house, Bob Rodak, removed these alterations, and infilled the huge, original arched openings with solid sheets of glass. This is how things have remained. This is how the porch looked when I purchase the house in March, 2014. The huge arched openings have huge sheets of glass in them. 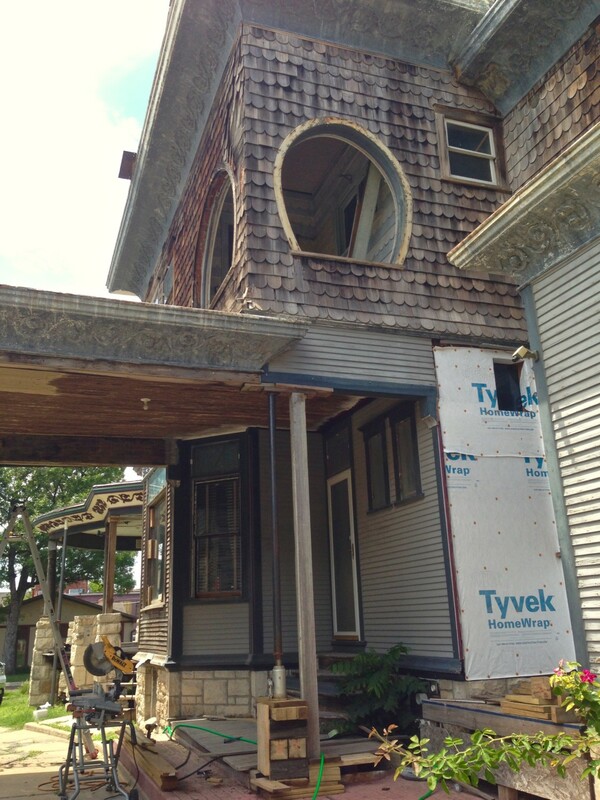 My plan has been to return the porch to an all-weather space, and I have been looking forward with great anticipation to removing the glass. I fantasize about standing on the restored porch, late at night, with a glass of wine in hand, as a blizzard rages. I will pull my down-filled jacket tight, sip from the crystal glass…and smile with delight. …to rest against the mantel in the Sewing Room. I did not want to put the glass back in, so thought: Hey! 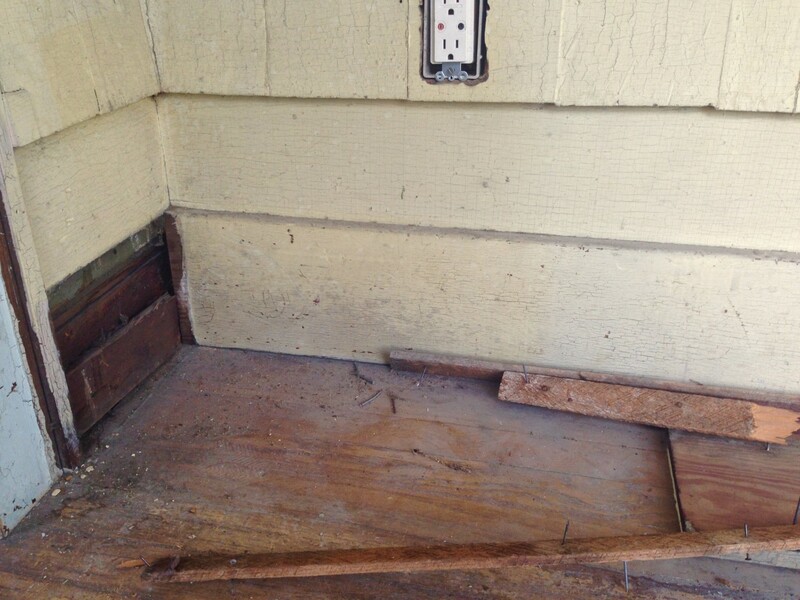 Let’s remove the non-original porch flooring, to reveal the original porch floor! When the porch was enclosed it had a new floor installed, which appears to date from 1950, and is contiguous with the adjacent Sewing Room. So, was the porch enclosed in 1950, when the house converted into a motel? Or was the oak floor from 1929 when the house was converted into apartments? In any event, I knew the original porch floor would be under the later floors, and assumed it would be squares of galvanized tin soldered together. Or something. 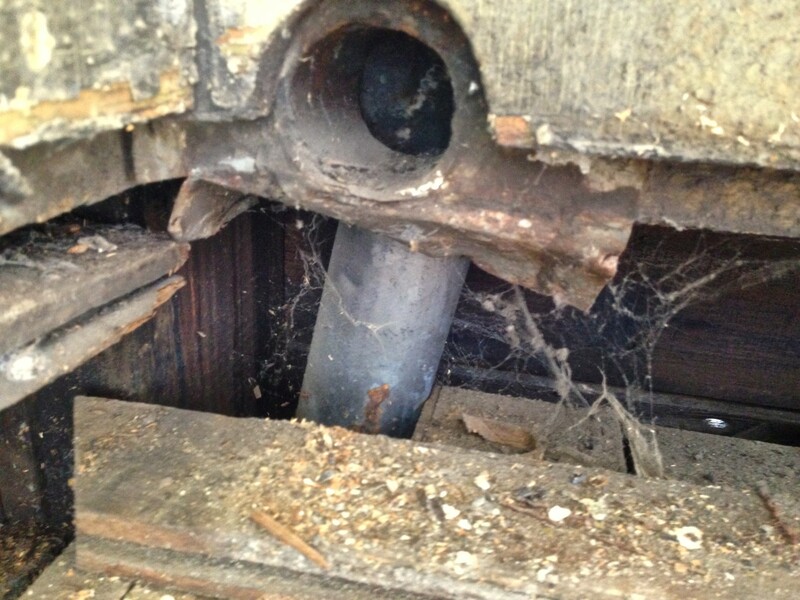 Outside the porch, in the SE corner, is the original porch drain. Cool. The drain is well below the oak flooring. Breathless with excitement, we started removing a section of the presumed 1950 flooring. WHAT would be revealed under???????? What???????? WHAT???????? Oh! Under the oak floor was a pine floor. Oh! 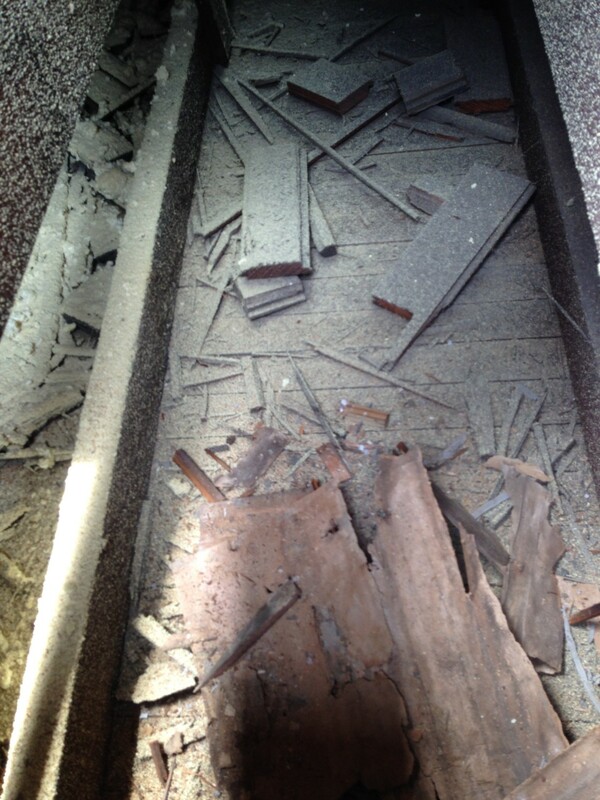 But this floor did not appear to be original, and seemed like flooring which had been salvaged and roughly installed. Was this a subfloor for the presumed 1950 flooring? Or was it flooring from 1929? 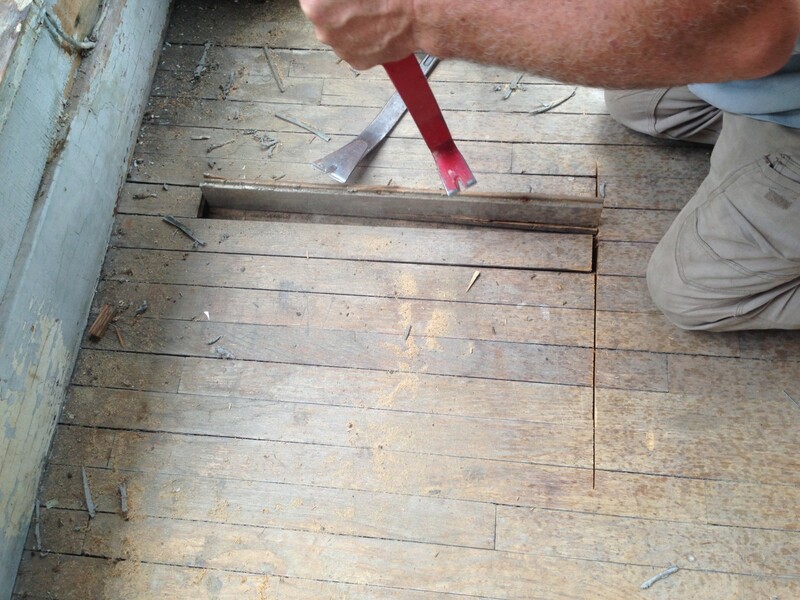 Well, we cut through this second floor, BREATHLESS to find the original porch floor! But…well…ahhh…huh…POO! There WAS no original porch floor under! There was actually…nothing. All that we found, inexplicably, was space. A lot of space. 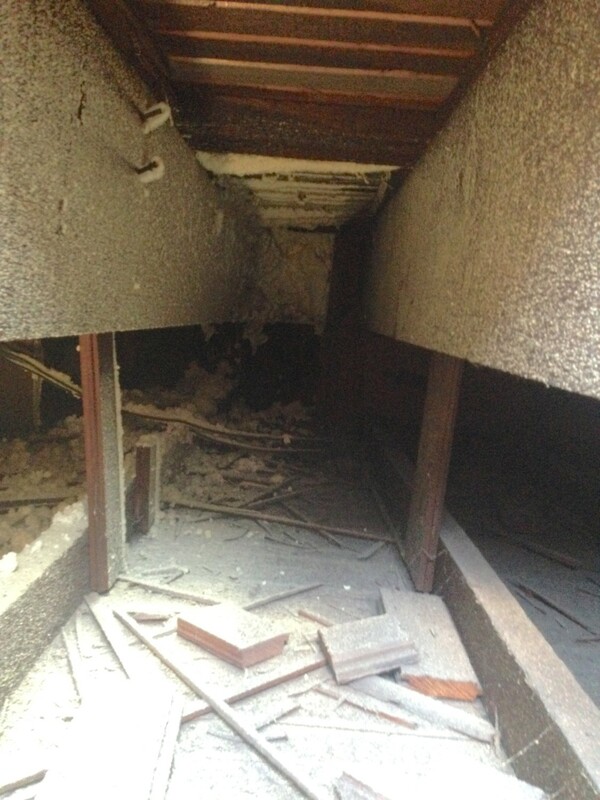 Two feet BELOW the oak floor was the wood ceiling of the porte-cochère, and layered with a lot of debris. Huh???????? This debris did not appear to be original (no self-respecting builder would leave such a mess). At this point, we all just stood, staring at each other dumbly. WHERE was the original porch floor? WHY would anybody have bothered to rip it out? It would have been easily just covered over. I was altogether perplexed. And not happily. …explains what you are looking at. Note the STAR trim. This is a vital clue! We removed the non-original base. It came off pretty easy. 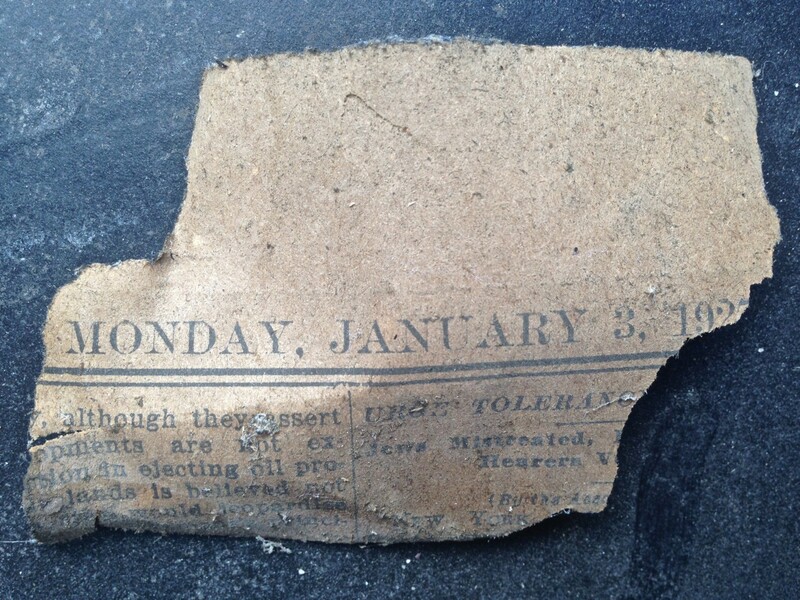 Behind it we discovered this newspaper fragment. It appears to be dated 1927. A clue? Or just an old bit of newspaper? 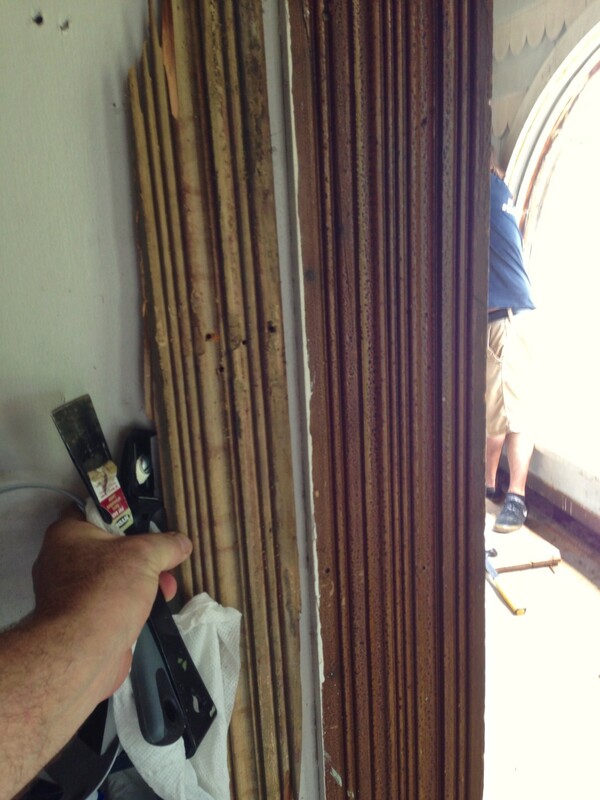 There was also a brutalized section of original interior trim used as filler behind the base moulding. I strongly suspect that this came from the bottom of the original window facing the porch, which was later converted to a door to the porch. Hence, the bottom trim would have become superfluous. All this was fascinating, but we were still mystified. Where was the damn original porch floor? And the new vantage point revealed all. As we sat, we could clearly see the bottom of the STAR trim (this is the trim with a star next to it, in my drawing above this drawing), which had been covered by the base. And the bottom of the STAR trim was not level. Each length was angled. In the high-point corner, the bottom of the STAR trim was 5-inches below the shingles. In the opposite corner, the STAR trim was 8-inches below the shingles. This is the high point. The arrow points to the bottom of the so-called STAR trim. This bottom edge had been covered by the non-original base (seen to the right). Note how the base only covered 3/4-inch of the STAR trim. This is the low point. The arrow points to the bottom of the so-called STAR trim. This bottom edge had been covered by the non-original base. Note how the base covered 3-inches of the STAR trim. It was instantly apparent how wrong our assumptions were. There was never a porch floor UNDER the non-original flooring. 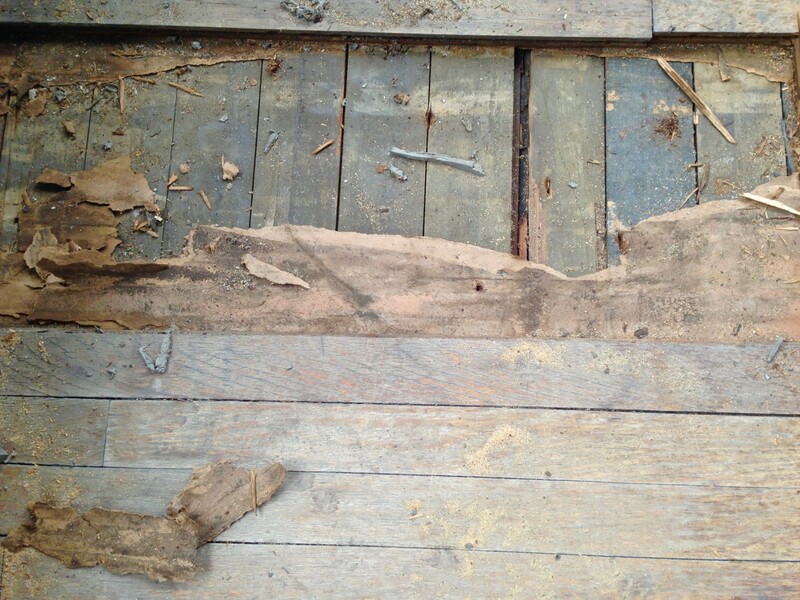 The porch floor had been ABOVE the non-original flooring!!!!!!!! Yep, just how we felt. The original porch floor was, as is normal for a porch floor, not level. 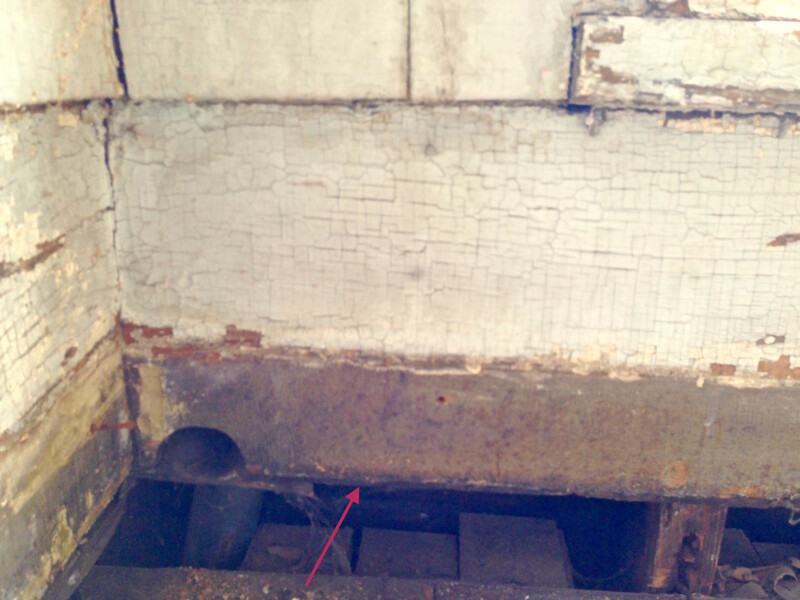 The floor was constructed to funnel water to the drain in the SE corner. After the floor was installed in 1894, the STAR trim was installed on top of it, and scribed to fit the un-level floor. 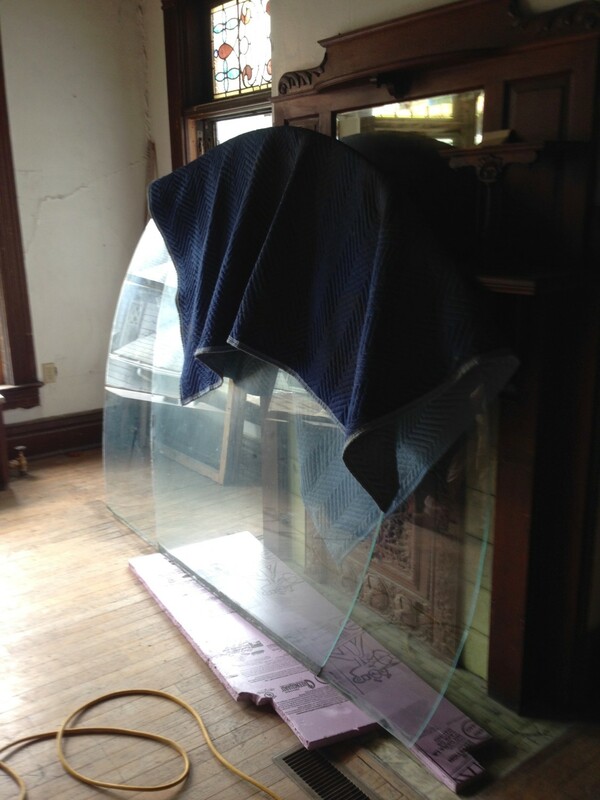 Originally, one crawled through a window in the sewing room to access the porch. No, really. So, the fact that the porch floor was a bit higher than the sewing room floor would not have been obvious. But when the window was converted into a door, a contiguous floor between the rooms would have been prudent. So, the original porch floor was removed, and a prudent floor laid. Assumptions. The cause of all misery. When we pulled off the last section of non-original base, we revealed the TOP of the drain. WE FOUND IT!!!!!!!! We had assumed that the drain has been a straight shot, but now realized that the drain zig-zagged from top to bottom. Yep, just how felt. Again. The current plan is to recreate the lost porch floor next week. 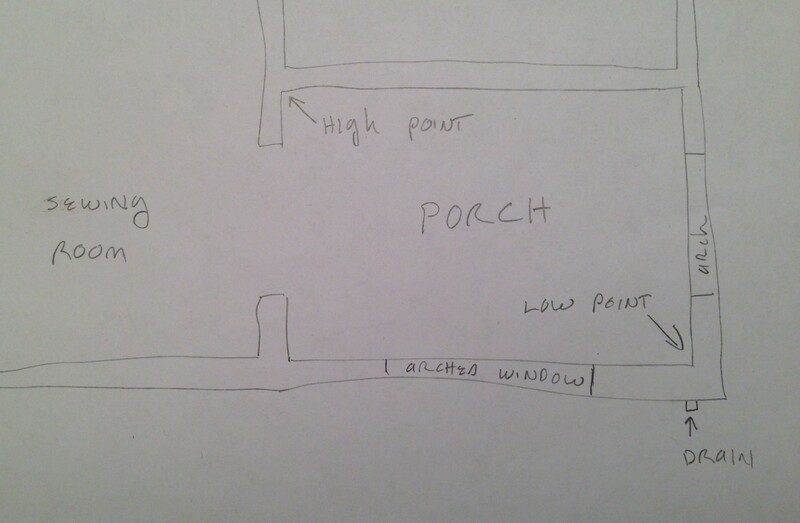 8 Responses to A Porch Floor Mystery! I had trouble following this one! Glad you figured it out! I will be looking forward to seeing your solution! I just can’t believe that the porch was built to be accessed through a window! The house is so well designed etc. this just blows my mind! Ross, will you recreate the original window or leave it as a doorway? A doorway is nice but you’d have to step up to the restored porch level, wouldn’t you? I had to read this a few times to understand. (Even though you marked it with a star, my mind was looking for something star shaped. 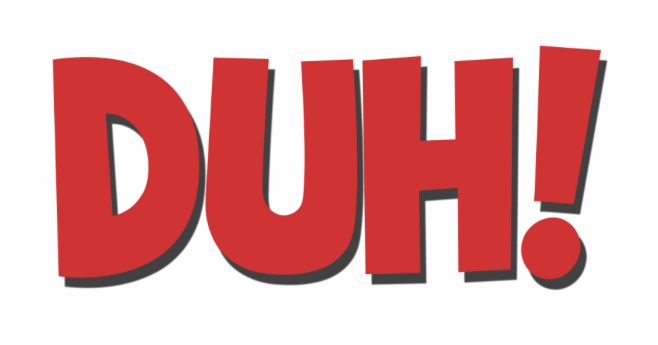 Duh!) 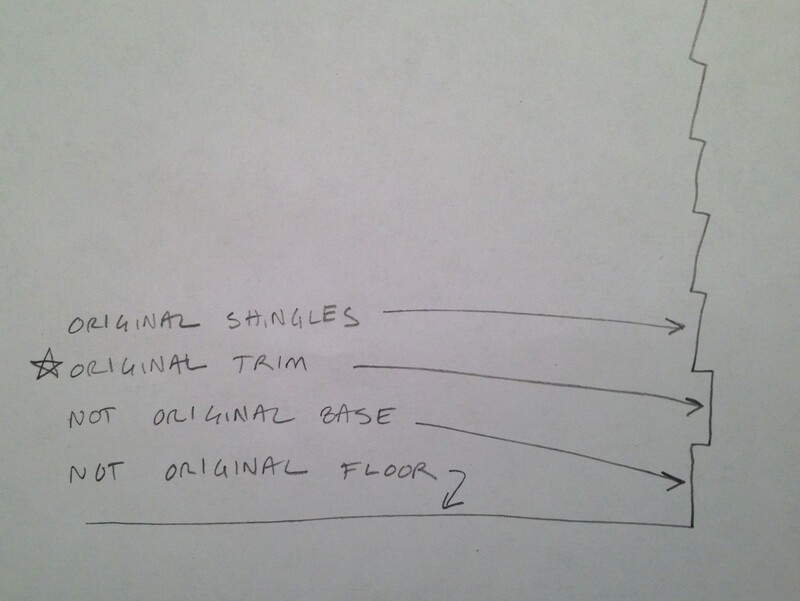 But where the original siding ends, is the level of the old floor? Is that it? And will you clean out the mess in the space before you cover it? Love reading about your progress and discoveries. Thanks for sharing. Will you go for a tin floor? Wouldn’t that be treacherous on those evenings? 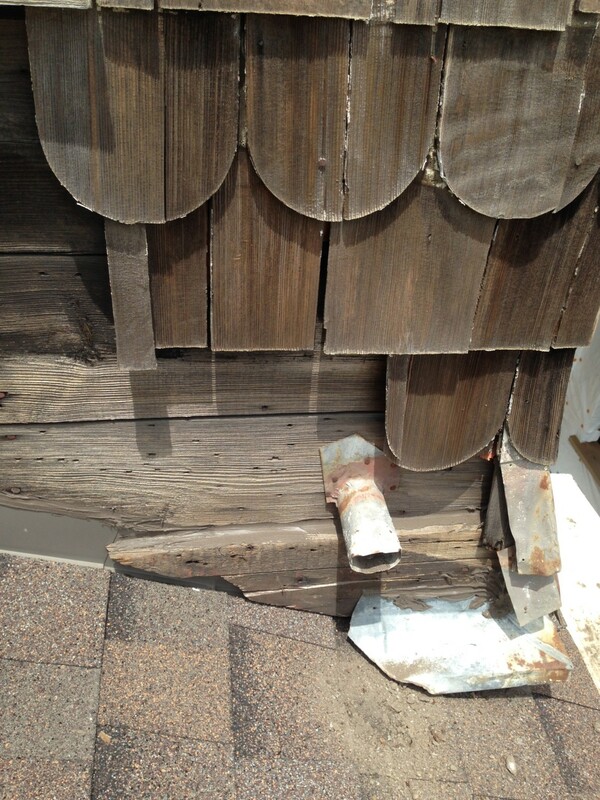 There is horizontal trim BELOW the shingles. This what I called the STAR trim (because I put a star next to it in one of my drawings). 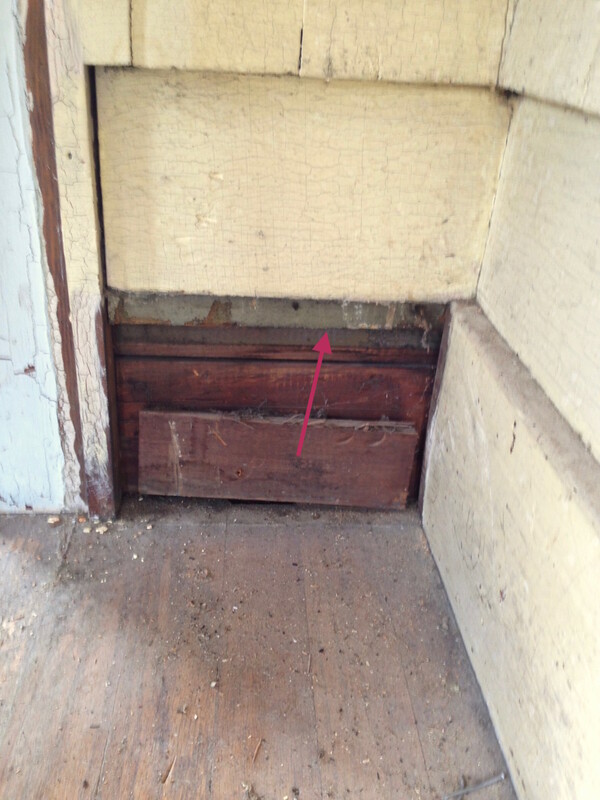 The BOTTOM of this trim is not level, and this is where the original, non-level floor was. And, yes, I will clean out all the mess in the attic space! I will even vacuum it! The new floor, for now, will be painted marine-grade plywood. I have ZERO idea of what the original flooring was. Maybe they pulled up the original flooring to use somewhere else? Now I wonder if the current subfloor is reused original flooring? I will know more this week! This post completely intrigues me since this was part of the apartment Lana rented in the 1970s. Yup! I can breath again! Sigh! What will you do with the glass?